This new magnetic separator delivers a better method of cleaning. In addition, the design improves operator safety and efficiency. 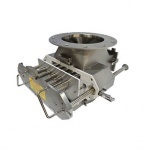 At the heart of the product is an inline magnetic separator for use in vertical chutes. This allows the efficient extraction of ferrous particles in powder or granular materials being processed. The semi-automatic feature makes the cleaning process of removing ferrous contamination from the magnetic rods both faster and easier. This is thanks to the “scraper plate” design technology.